In addition to building the car of the future and disrupting the age-old road system, Tesla CEO Elon Musk has also vowed to establish a colony on Mars as part of his SpaceX initiative – and it seems the company is gradually approaching its goal. 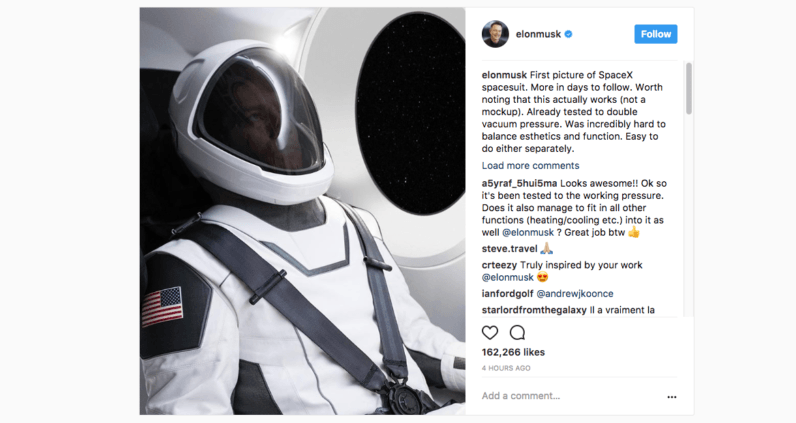 Earlier today, the visionary entrepreneur took to Instagram to share the very first image of the SpaceX spacesuit. Promising more photos and details in the days to come, Musk noted that the spacesuit shown in the picture is fully functional and has already successfully undergone testing in double-vacuum pressure. The Tesla boss also took a moment to express his satisfaction with the final product, revealing that the purpose was to combine both “[a]esthetics and function,” which proved to be an “incredibly hard” task. Musk fan boys and girls will probably recognize the suit very closely resembles the infamous leaked SpaceX designs from over a year ago. While many doubted the authenticity of the images back when they first surfaced on the internet, the new picture does add more credibility to them. The image comes merely days after SpaceX successfully launched a rocket from the Kennedy Space Center in Cape Canaveral on August 14.